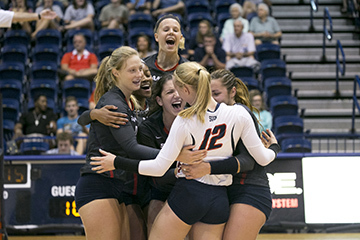 The Samford volleyball Bulldogs will play at 5th-seeded University of Kansas in the first round of the NCAA Tournament, it was announced during the NCAA Tournament selection show Sunday evening (Nov. 27). The game is Thursday, Dec.1, at 6:30 p.m. CT. The Bulldogs earned their bid to the NCAA Tournament by winning the Southern Conference tournament. Kansas won the Big XII championship.